Goose is the name for a considerable number of birds, belonging to the family Anatidae. This family also includes swans, most of which are larger than geese, and ducks, which are smaller. True geese are medium to large birds, always (with the exception of the Néné) associated to a greater or lesser extent with water. Most species in Europe, Asia and North America are strongly migratory as wild birds, breeding in the far north and wintering much further south. However, escapes and introductions have led to resident feral populations of several species. A pair of geese will get together to raise a family and, for the most part, will stay together the rest of their lives (up to 25 years), raising new families each year. Geese have very strong affections for others in their group (known as a gaggle). If one in the gaggle gets sick, wounded, or shot, a couple of others may drop out of formation and follow the ailing goose down to help and protect him. They try to stay with the disabled goose until he dies or is able to fly again, then they catch up with the group or launch out with another formation. Much of a goose's time is spent foraging for food, most of which is obtained by grazing. All geese eat an exclusively vegetarian diet. They honk loudly and can stretch their long necks out to great length when scared or threatened. Geese tend to lay a smaller number of eggs than ducks. 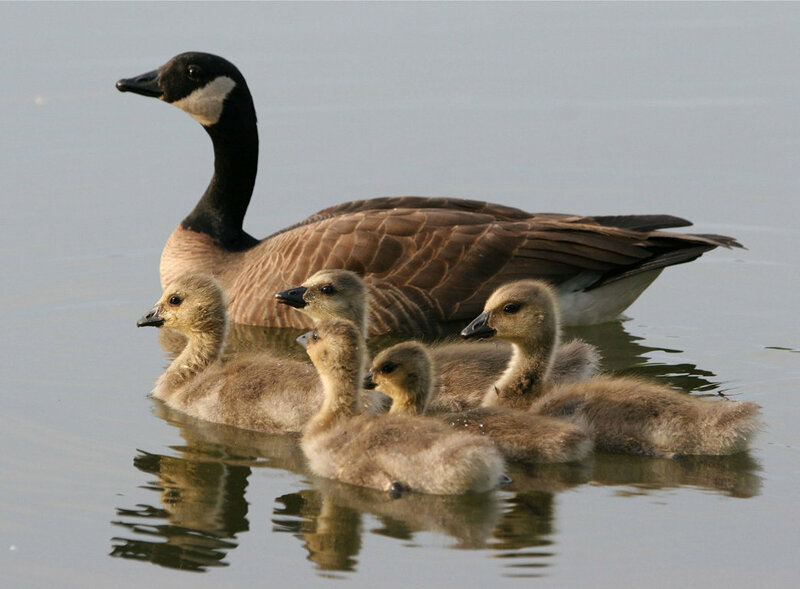 However, both parents protect the nest and young, which usually results in a higher survival rate for the young geese, known as goslings. A group on the ground is called a gaggle. When flying, a group of geese is known as a wedge or a skein.